Compared to MP4, AVI (Audio Video Interleave) is a lossless container format with large file size and commonly used by film and television post production. Though AVI format has quite a long history, it's not dead, instead, it's widely accepted due to its nice image quality and good compatibility. MP4 to AVI conversion is a process that requires a lot attention to output quality, efficiency and file size. The higher the quality, the bigger the file size will be, and the longer it will take to convert MP4 to AVI on Mac. But the first-in-class MP4 to AVI converter for macOS, MacX Video Converter Pro can cover all your needs. The most stunning features are listed below. 1. Convert MP4 to AVI on Mac in blazing fast speed with minimum CPU usage thanks to HT tech, Multi-core CPU (up to 8), Intel QSV acceleration tech. 2. Embedded High Quality Engine promises nearly no quality loss during MP4 to AVI conversion on Mac. 3. Built-in 370+ video audio codecs, it supports to transcode MP4 with H265 or H264 or any other codec to AVI, and convert any video to 180+ video audio formats without quality loss, like AVI to MP4, MKV to MP4, MP4 to MP3, FLV to AVI, to name a few. 4. Support to convert 8K, 2160P 4K, 1080P, HD SD MP4 videos to AVI with smaller file size and adjustable parameters, like resolution, bit rate, frame rate. 5. Download MP4 video from YouTube, Facebook, Vimeo, Dailymotion etc. to AVI format. 6. Support to convert MP4 to AVI on macOS Sierra. 100% clean and safe, no ads, no plugin. Click "Add File" icon at the top-left corner and choose MP4 file to load or simply drag and drop the file to the main interface of the MP4 to AVI converter for Mac. After the MP4 file is loaded, you are allowed to select AVI Video (Divx +MP3) as output on the Output Profile Window. If the source MP4 file size is too big, follow to compress MP4 without losing much quality. Click "RUN" at the bottom right corner to process converting MP4 to AVI format on MacBook or iMac, and get AVI advantages over MP4. Online MP4 to AVI converter for Mac is very simple to use and users don't need to download any other free MP4 converter for macOS. We sort out a reliable online app, files-conversion.com. Learn how to free convert MP4 to AVI on Mac online. Step 1: Go to http://www.files-conversion.com/, Click "Select a File" and load it. Step 2: On the Quality section, choose the quality you want, low, moderate, high, or very high. Step 3: Click the drop-down menu, choose convert to AVI format. Step 4: Select output Size. The higher the resolution, the larger the file size will be. Step 5: Click "Convert" and start to free convert MP4 to AVI on Mac online. Step 6: When the MP4 to AVI conversion is finished, click the file icon and download the converted file to your Mac. 1. We received error message when converting a 131MB 1920*1080 MP4 video to AVI on Mac online. 2. Most online MP4 to AVI converter for Mac programs are supported by ads, and some even have spyware, malware and misleading icons. 3. It may take much longer time to free convert MP4 to AVI on macOS online. Some crash or stop working at half time. 4. AVI and MP4 video audio codecs are limited. 4K UHD and resolution are not supported to convert. 5. Some ask for email address to receive AVI file converted from MP4 online on Mac, which may lead to email address leak. Can HandBrake and VLC Convert MP4 to AVI on Mac Free? 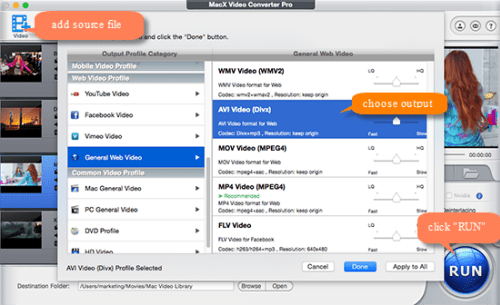 There're many open source free video converter for Mac that can convert MP4 to AVI on Mac. Speaking of open source video transcoder, Handbrake may come to your mind. But MP4 to AVI conversion with Handbrake is a removed feature. Handbrake only support to convert AVI to MP4 on Mac or convert MP4 to MKV or to MP4 format with H.264, MPEG-4, MPEG-2, H.265 video codec. So, we cannot convert MP4 to VLC on Mac using Handbrake. Video conversion is also a hidden feature coming with VLC media player. Can we use VLC to convert MP4 to AVI on macOS? The answer is no. There's no AVI output in VLC media player. VLC can only convert MP4 videos to Webm (VP8), TS, OGG audio etc. Neither Handbrake nor VLC support to convert MP4 to AVI on Mac. Check out Handbrake and VLC support output formats if you want to convert MP4 video to other formats with these open source applications. MP4, MKV (video encoders: H.264, H.265, MPEG-4, MPEG-2, VP8, VP9, Theora. Audio encoders: AAC, HE-AAC, MP3, FLAC, AC3, Vorbis). Free download the best MP4 to AVI video converter - MacX Video Converter Pro to quickly convert MP4 to AVI on macOS (Sierra also supported) with original quality reserved.